All this week, I will be pulling out some of my favorite old projects from my Holy Craft archives. For now, enjoy this project from April 2010. I am so excited that I finished this project this week. I have been in the process of making it for a few weeks now, mostly because I needed some help from the hubby and he doesn't work on the same schedule that I do! 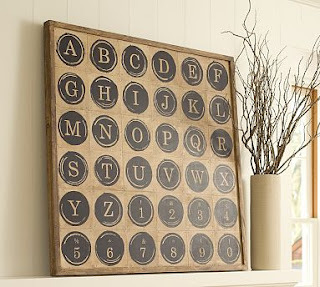 I love this typewriter key wall art from Pottery Barn, and thought for sure I could make something like it for a fraction of the cost. This is my version. I think it's pretty darn close! I started by searching on-line and knew there would have been someone who managed to recreate this. I stumbled upon Nikki at dream.design.create and found her post here . Nikki even offered to send me the pdf file for the letters, which I think look a whole lot like the PB original. So that's where I started. Wasn't that sweet?! 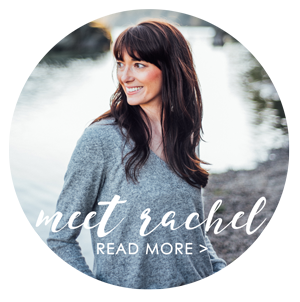 Nikki's blog is great, go check it out if you haven't already. I love their bingo art re-make and can't wait to try that too! The typewriter font can be found here. I had my husband print the letters/numbers off on 8 1/2x11 cardstock in a cream color. I couldn't figure out how to print cardstock on our home computer, so I am thankful that my husband could do it at work. Then I hand cut each letter out. My husband picked up this board at Home Depot for me. It's 24x24. I thought for sure that I could use some scrap lumber for this project, but my husband insisted on getting a higher quality plywood. It cost around $5 for the board. Then he drew the lines on and used a saw to cut them out. Not sure how, I told him what I wanted and how I wanted it, and he did it! I love it when husbands do what they are told! I then took brown oil paint mixed with odorless mineral spirits and painted the board. I wanted it a bit darker than the original, and focused on the edges to make a more antiqued look. I must say, this is the step that intimidated me the most. I don't use decorative painting techniques very often...o.k. ever, so it made me nervous. I used an old rag dipped in the mineral spirits to rub the paint down a bit and give it my desired look. In the picture below, you can see it getting started. Don't forget to get a smaller brush and get inside the creases. I also wasn't sure if I wanted to frame the board or not, so I painted the outside edges too. My husband then took the dry board and nailed black carpet tacks to each corner. He made the hole first with a regular nail and then was able to just push the tacks in. He's a genius isn't he?! 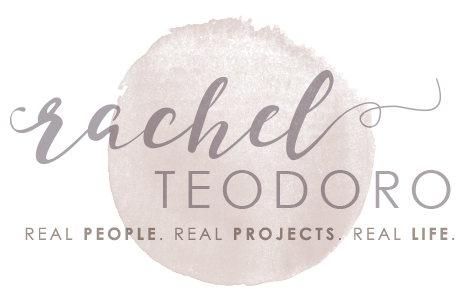 Can you believe that I haven't ever used mod podge before? This is my first jar and I fell in love! It's so easy to use. I just took the letters and numbers, placed them centered on each square and brushed them down. And here it is drying. What do you think, should I frame it or leave it frameless? This by far has been one of my favorite projects! Do you have a favorite Pottery Barn knock off you have created?